At that time there was Fascism, a dictatorship that glorified the myth of the he-man, the warrior. But on the screen, and on the stage as well, a rather different kind of man was all the rage, a man without particularly lofty ideals, concerned exclusively with his sexual conquests and his success in business. In other words, the spirit of that Parisian version of light comedy known as "boulevardier", also triumphed in Rome and Milan, in Palermo and Genoa. If anything, it may be pointed out that in films the French model was soon replaced by the Central European model as it had evolved between Vienna and Budapest at the time of the Austro-Hungarian Empire. By no accident, Hungarian plays were taken as the starting point for Italian films, writers moved from Budapest to Rome to prepare scripts, actors were at home in studios of both capitals. This brand of comedy was given a nick-name: "white telephone" films. In fact, phones of that color did not exist at the time and could only be seen in the elegant homes of the millionaires in those films, where men wore tails and women glittered with jewels. It was a fuatous world, hardly representative of Italy in those years, and whose sole purpose was escapism. It would not be fair, however, to reduce all Italian cinema of the '30s to "white telephone" films. 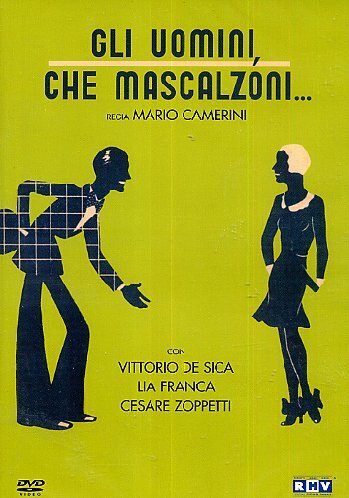 In 1932, Rome-born director Mario Camerini (born in 1895) made a considerable splash with GLI UOMINI, CHE MASCALZONI... [MEN, WHAT SCOUNDRELS...], presented that same summer at the first Venice Film Festival. Here the characters and setting were altogether different from those of the "white telephone" comedy. The leading character was a Milanese driver, Bruno, who lost his job in order to woo Mariuccia, a salesgirl in one of the stands at the Samples Fair and the daughter of a cab driver. An ordinary love story about ordinary people, far removed from the "heroes" proposed by the Fascist regime, but even further removed from the luxury of the upper middle-class world fondled by the "white telephones." So Camerini invents a light comedy which is popular in flavor and setting, "discovers", cinematographically speaking, Milan, the industrial capital of Italy, and at a time when everything had to be built in the studio, carries his troupe from Rome to Milan and does the actual shooting among the stands of the Samples Fair. The film brought a breath of fresh air to the Italian screen and launched an actor, Vittorio De Sica, who hadn't succeeded in breaking into films before because the biggest producer of the day, Stefano Pitaluga, felt he wasn't photogenic. The success of GLI UOMINI, CHE MASCALZONI... also led to the success of the sentimental song De Sica sang in it: "Parlami d'amore, Mariu", by C.A. Bixio.